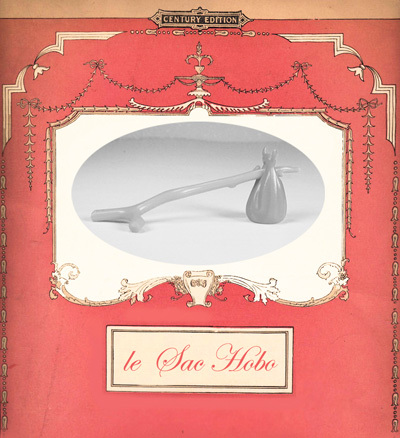 the real hobo bag. i would like to bring this back. 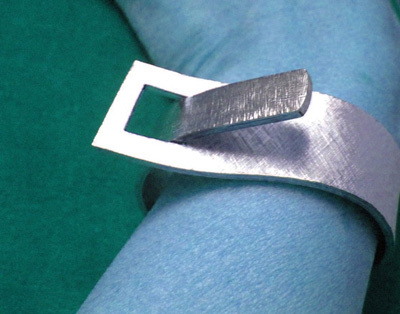 a silver stick. a floral fabric for the bag. or more soigne, something dark & elegant. it’s doable. believe me? from the 1989 Policeman & Tramp Playmobil Set 5504.
hardware obsessed aka "what's the load bearing on that?" or "do you have some bigger bolt cutters?" i’ve always liked metal and studs and buckles. but my like has bloomed into “i think about hardware all the time pretty much”. my makings evolve from the hardware i find. hardware access dictates my life! i have bowls and rolls of chain in my studio. tiny metal swans. “O” rings and “D” rings. bronze and stainless steel. super long zippers i just love to pick up and wonder what i could do with them. huge heavy silver buttons from the 60s, that i think because of their weight i can call them hardware. and a fine pair of bolt cutters that i really cherish. and buckles! my love of buckles has migrated into everything i wear. i bought glasses with tiny faux buckles on the side. i collect vintage mexican silver buckle bracelets [they keep breaking!]. i have thrifted vintage rhinestone studded buckle earrings… i have a lot of this buckle stuff. 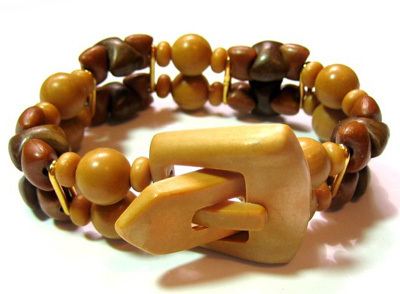 yesterday i found and bought this vintage wood buckle bracelet from Etsy seller penorus. 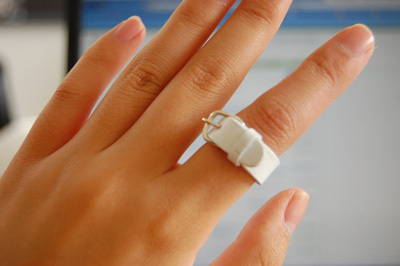 i love this tiny white leather buckle ring by Miss Bibi. found thru and photo from Style Bubble. and here’s one i want but won’t be getting just because i can’t be flinging cash around willy nilly can i? 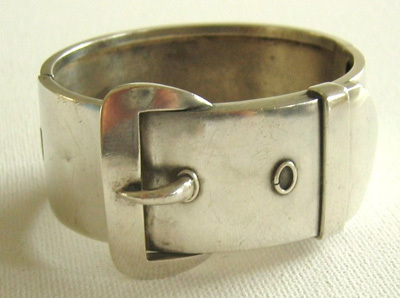 a mid-century buckle cuff from Carmen & Ginger. 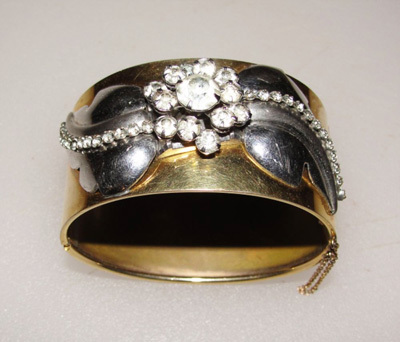 a silver Victorian cuff from Gorgeous Things. you know, this floral thing, i’m in pretty deep. my desktop is a mass of floral finds. and i just give in. i’m going to post it all. 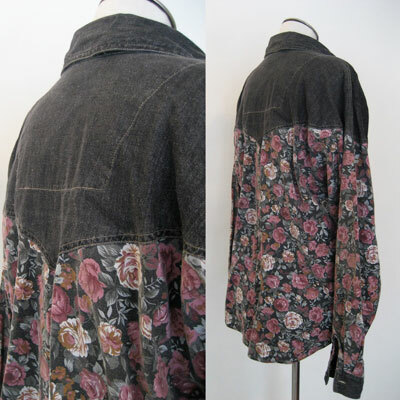 perhaps for fall the flower obsession will wain. we’ll see! so… here is an amazing 80s shirt i didn’t manage to get on Etsy. i love it. i had visions of wearing it with leggings and great boots. oh well. 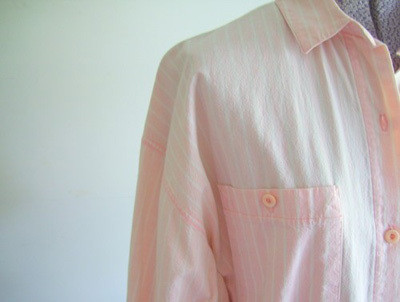 80s shirt dressing in pink & white stripes. here’s a current mini-obsession of mine. 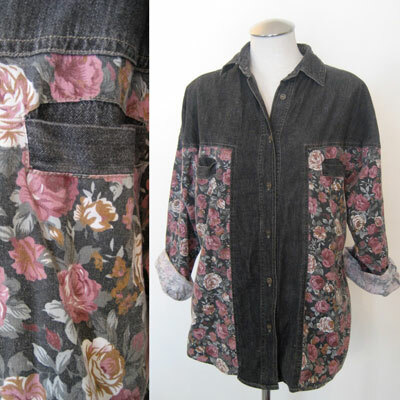 80s shirt dresses. that men’s style for women look. like this one from Retro Lane. 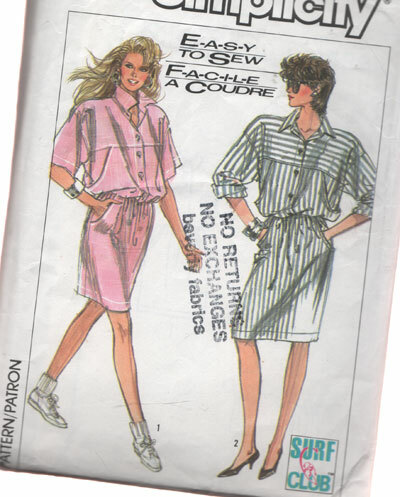 it’s Simplicity 8569 if anyone wants to know. simply called nemres, and it’s full of wonderful finds. rose dress here. nemrešpobjećodnedjelje is another of my flickr friends whose style i love. end of story. i’m just sewing like crazy. sorry for lack of visual updates. i’ll get a wardrobe shot in tomorrow hopefully. not like people are pining for one! but it actually makes me feel more connected with this whole online thing when i get a wardrobe photo in there every so often at least. 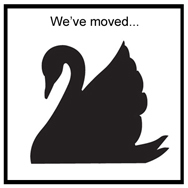 so new items going up this week. including finally my summer totes. they will probably be the last of my new designs for this summer, though there really are a small pile still waiting to get out! we’ll see. and thanks for the custom orders coming in. like i’ve said before, i really enjoy collaborating on your orders. so bring it on! and wanted to say thanks for some recent SWANclothing mentions, and by fellow canadians no less. my Venice dress by the adorable and sunnily stylish [even in the rain!] Tara-Lynn of YarnOverMovement. And again the Venice dress by my sweet online friend Christophe. I love the title of the entry THREADSday: Du côté de chez Swan, I think I always say that when there is some francais involved. i love this Black Countess Noir Earring from Tattered Rouge. there’s a bunch of Ear Nibbles to choose from. i think they are really smart, simple & beautiful. oh, and the sale ends today on my two SWANclothing Fringe Corset Dresses. thank you and happy afternooners! 4 years of SWANclothing. handmade & the internet... the sweet side. i’ve been working on SWANclothing for four years now. [2006 2007 2008 2009]. and some of you may have read my somewhat perturbed blog entry about my frustration with some aspects of handmade a few days ago. but there is a whole other side to the story. and it’s huge. and sweet! i love what i do, i endlessly see in my mind and scribble on paper, dresses and bags and other things i plan to make. and am every day in touch with forward thinking, [floral loving], creative, supportive, intelligent women, each with of course their own identities and style. as we all know, the internet is so funny with it’s embodiment of closeness and distance. and though i haven’t met most of you, i just wanted to say thanks for your support and interesting minds and all the beautiful things you share because you have changed my life. 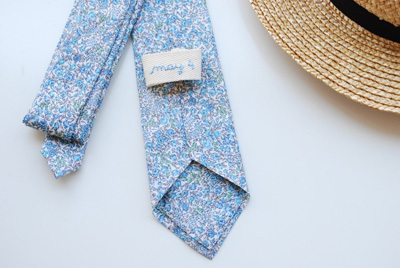 one of Fieldguided’s custom made ties. 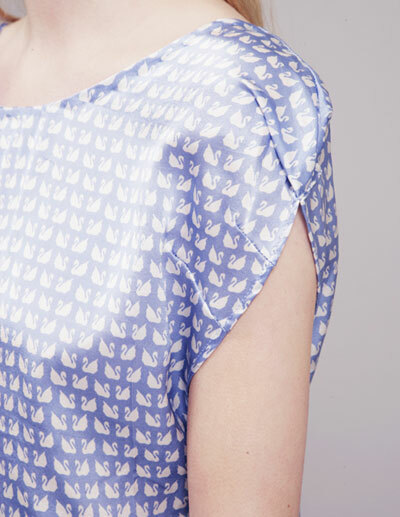 i love this one in blue cotton lawn fabric. your name or chosen text is embroidered on the underside. this is a thing of beauty. and i have plans to add one to my tie collection soon. about finished 2 more sweet little SWAN items, a top and dress. was going to take a wardrobe photo today but it’s pouring. 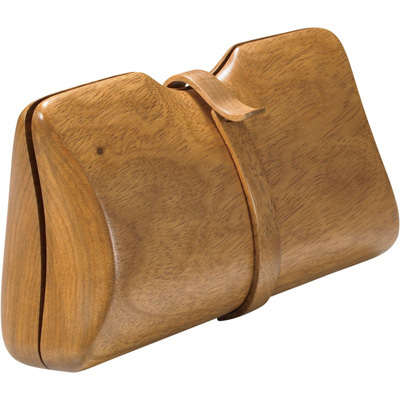 so how about a beautiful Wooden Clutch by Ports 1961 instead? from Pixie Market. sweetly sent to me by -h of the intriguing Miami street style blog Candid Cool. [i am a bit Miami obsessed these days & always…] oh, and she sent the link not the blouse, but if anyone wants to send me the blouse that is just fine by me.